It finally rained today. Summer is skin drying in here. Monsoon, the ethereal, rain-god of weather sciences, was expected to show in New Delhi on 18. We wonder if the right label for the rain is Monsoon or pre-monsoon. Anyway, it started to drizzle at about noon. Unlike the typical start of rainy season, it was a mature shower. Slow but steady. Rain: the primary elixir of life!. Rapid and brisk but patient. It is past seven in the evening and the evening stroll, an hour ago, under an umbrella touched by slow but consistent drizzle, was pleasant experience as usual. All the way through clusters of housing, convenient balconies for rain watching, I missed rain watchers. There were none. Everybody too busy, on Sunday, to enjoy the marvel of weather. Why? No they are not stoic. No way. Scientist go up in joy to find semblance of proof of water on any planet. We continue to be busy with the chores, we created for ourselves, yesterday. We go to temple, church, mosque or prayer house, claim to be bound by faith, but forget rain or the thanks for it. It is enough that faith gives us security and we can continue to do what we like, without looking up and be thankful to the institution. Thanks rain for being with us so often. Thanks also for cooling. Thanks also for being early and yet being mature. Thanks to the elixir of life. 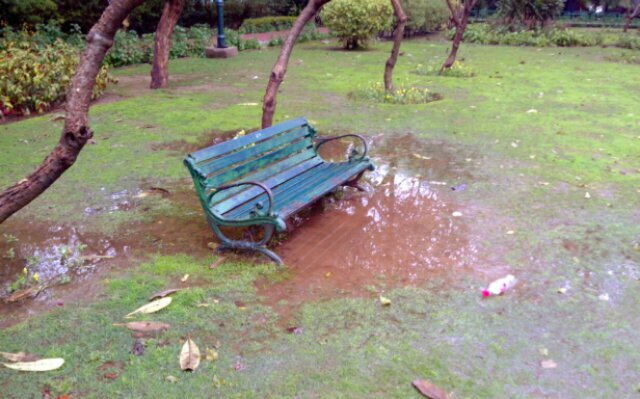 This entry was posted in Life and tagged Earth, Life, New Delhi, Rain, water. Bookmark the permalink. It is not the Mama who forgot the limits. It was the children. The calamity has taken very heavy toll. Thousands missing, perhaps dead in deluge. Partly they were at wrong place at wrong time. Secondly stupid constructions made very near to glacier river, presuming that it will not swell the way it used to, about 80 years back. Whole town of Kedarnath has been swept away, except the sanctum sanctorum of the temple. BTW, those who could be saved is because Mama granted recess. Thanks for this observation. Though I blather about “weighty” matters, it is important to recognize and respect…and revere…”mama nature” as she is where we came from! BTW, rain continued over night and it is still raining. Now thunders have also joined the show. It appears yesterday, thunders were busy menacing people some where else.